Annual house price growth almost ground to a halt in January as fears over Brexit deterred buyers, according to Britain’s biggest building society. Nationwide said the average price of a home rose 0.1% from a year earlier to £211,966 in January. This was the smallest annual gain since February 2013, when the rate was zero. Property values were 0.3% higher in January compared with the previous month after a 0.7% monthly decline in December. Hansen Lu, a property economist at Capital Economics, predicted house prices would rise by 1% this year, assuming a Brexit deal was done. 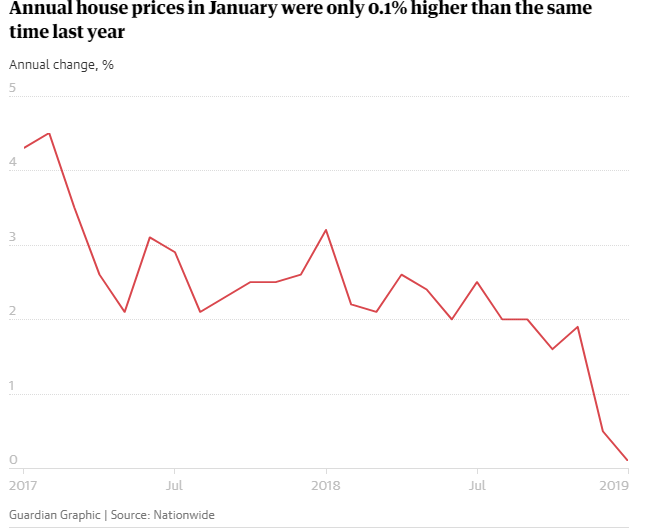 A no-deal Brexit would lead to flat prices or a gentle fall this year, but he said Britain would escape a house price crash. “Even if a deal were to be done soon, the market would still be held back by high house prices. And any economic upswing following a Brexit deal would come hand-in-hand with rising interest rates, which would also keep demand growth contained,” Lu said.